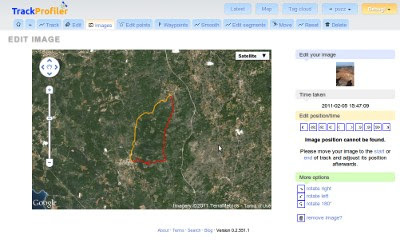 If the image position can't be found -- the photo won't be shown on the map and You'll get a message about it. And, by the way. Photos aren't correctly geopositioned when the camera time wasn't synchronized with the GPS time. When you upload and position your first photo -- TrackProfiler will memorize the "correction time" and all the following images on the same track should be OK.
"TrackProfiler will memorize the "correction time" and all the following images on the same track should be OK."